Today the European Commission is publishing the results of the 2018Digital Economy and Society Index (DESI) , a tool which monitors the performance of Member States in digital connectivity, digital skills online activity, the digitisation of businesses and digital public services. According to it, the EU is getting more digital, but progress remains insufficient for Europe to catch up with global leaders and to reduce differences across Member States. This calls for a quick completion of the Digital Single Market and increased investments in digital economy and society. Andrus Ansip, Vice-President for the Digital Single Market, said: "This is a shift, albeit small, in the right digital direction. As a whole, the EU is making progress but not yet enough. In the meantime, other countries and regions around the world are improving faster. This is why we should invest more in digital and also complete the Digital Single Market as soon as possible: to boost Europe's digital performance, provide first-class connectivity, online public services and a thriving e-commerce sector." Mariya Gabriel, Commissioner for Digital Economy and Society, said: "We look forward to a rapid progress on major reforms such as the European Electronic Code aiming at boosting investments in enhanced connectivity. This year's Digital Economy and Society Index demonstrates that we must deploy further efforts to tackle lack of digital skills among our citizens. By integrating more digital technologies and equipping them with skills, we will further empower citizens, businesses and public administrations. This is the way to succeed the digital transformation of our societies." Over the past year, the EU continued to improve its digital performance and the gap between the most and the least digital countries slightly narrowed (from 36 points to 34 points). 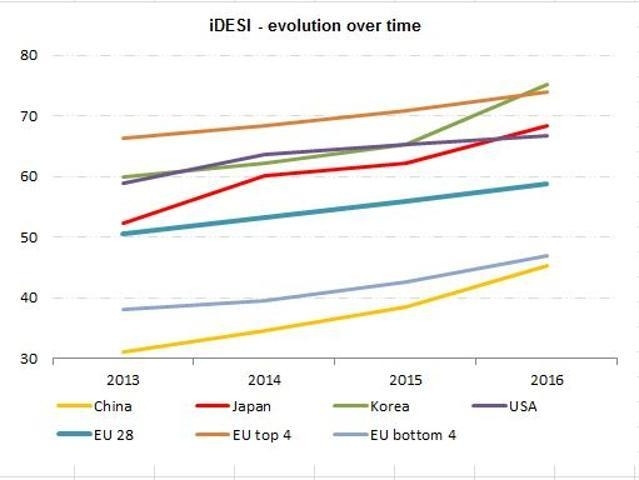 Denmark, Sweden, Finland and the Netherlands scored the highest ratings in DESI 2018 and are among the global leaders in digitalisation. They are followed by Luxembourg, Ireland, the UK, Belgium and Estonia. Ireland, Cyprus and Spain progressed the most (by more than 15 points) over the last four years. However, some other EU countries still have a long way to go and the EU as a whole needs to improve to be competitive on the global stage. Ultrafast connectivity of at least 100 Mbps is available to 58% of households and the number of subscriptions is rapidly increasing. 15% of homes use ultrafast broadband: this is twice as high as just two years ago and five times higher than in 2013. 80% of European homes are covered by fast broadband with at least 30 Megabits per second (Mbps) (76% last year) and a third (33%) of European households have a subscription (23% increase compared to last year, and 166% compared to 2013). The number of mobile data subscriptions has increased by 57% since 2013 reach 90 subscriptions per 100 people in the EU. 4G mobile networks cover on average 91% of the EU population (84% last year). Indicators show that the demand for fast and ultrafast broadband is rapidly increasing, and is expected to further increase in the future. The Commission proposed a reform of EU telecoms rules to meet Europeans' growing connectivity needs and boost investments. The highest increase in the use of internet services is related to telephone and video calls: almost half of Europeans (46%) use the internet to make calls, this is almost a 20% increase compared to last year and more than 40% increase compared to 2013. Other indicators show that 81% of Europeans now go online at least once a week (79% last year). To increase trust in the online environment, new EU rules on data protection will enter into force on 25 May 2018. 43% of Europeans still do not have basic digital skills (44% last year). Alongside the Digital Skills and Jobs Coalition, the Commission has launched the Digital Opportunity Traineeships to tackle the digital skills gap in Europe. The pilot initiative will provide digital traineeships for up to 6,000 students and recent graduates until 2020 in another EU country. While more and more companies send electronic invoices (18% compared to 10% in 2013) or use social media to engage with customers and partners (21% compared to 15% in 2013), the number of SMEs selling online has been stagnating over the past years (17%). In order to boost e-commerce in the EU, the Commission has put forward a series of measures from more transparent parcel delivery prices to simpler VAT and digital contract rules. As of 3 December 2018, consumers and companies will be able to find the best deals online across the EU without being discriminated based on their nationality or residence. 58% of internet users submitting forms to their public administration used the online channel (52% in 2013). 18% of people use online health services. In April 2018, the Commission adopted initiatives on the re-use of public sector information and on eHealth that will significantly improve cross-border online public services in the EU. The annual Digital Economy and Society Index (DESI) aims to measure the progress of EU Member States towards a digital economy and society. It helps EU countries identify areas requiring priority investments and action. The DESI is also a key tool when analysing digital in the European Semester, which allows EU countries to discuss their economic and budget plans and monitor progress at specific times throughout the year. This year, both DESI and the more detailed analysis of national digital policies, providing an overview of progress and of policy implementation by Member States (previously called Europe's Digital Progress Report) are published jointly using the DESI name. A more detailed Telecoms Chapter for each Member State is annexed to the reports. To make better comparison between Member States, DESI also develops cross-country analyses in connectivity, skills, use of the internet, take-up of digital technology by businesses, digital public services, ICT R&D and innovation investment and use of Horizon 2020 research and innovation programme funds by Member States. The Commission has presented 29 legislative proposals under its Digital Single Market strategy and called, in a recent Communication, the European Parliament and Member States to adopt these proposals by the end of 2018.